Senator Joni Ernst in her Iowa National Guard Uniform. First-term Republican Senator Joni Ernst is pondering retirement — from the Iowa National Guard. “This will be breaking news, probably, to my chain of command,” Ernst said late this morning during taping of the “Iowa Press” program that airs tonight on Iowa Public Television. Ernst said it’s been “very hard” to balance her work as a senator, her obligation to the Guard and her desire to spend time with her husband and teenage daughter. 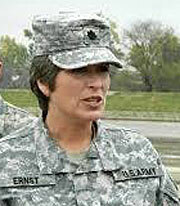 Ernst enlisted in the Iowa National Guard in 1993. After her election last November, Guard leaders moved Ernst from command of a unit to a position at Iowa Guard headquarters in Johnston. She’s likely to retire within the next year and coordinate her exit with superiors, to ensure there is someone in place to take over her duties. There is no prohibition against members of the Guard serving in the U.S. Senate. Half a dozen Guard members are currently serving in the House and the freshman Senator from Alaska is in the Marine Reserve.